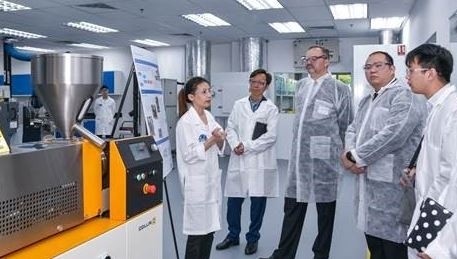 Swiss-based IAPRI member Omya has inaugurated a new Technology Center in Singapore, with the aim of working with customers, principals and local research organisations to help resolve technical challenges and develop innovative products for the Asian market. 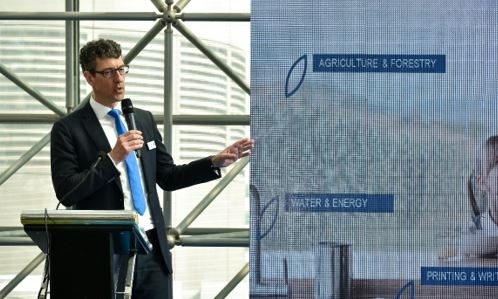 The Omya Technology Center Singapore (OTCS) saw its official opening on 14 March 2019, with 60 guests including representatives of customers, principals, local universities and government agencies. Guests of honour included the Swiss Ambassador to Singapore, Fabrice Filliez, the Executive Director of the Economic Development Board of Singapore (EDB), Lee Eng Keat, and the Chairman of the Swiss Chamber of Commerce and Industry in Singapore, Tom Ludescher. For polymer and packaging applications, the OTCS can customise mineral-filled masterbatches on a twin-screw extruder, and then sample all relevant polymer parts such as blown film or injection moulds. These can then be characterised in a climate room in compliance with international test protocols such as ISO and ASTM. During the opening, guests were given a tour of the new laboratory facilities to see the team’s analytical capabilities and equipment. These include x-ray fluorescence and x-ray diffraction analyses to characterise new materials and identify trace elements. The OTCS is also equipped to formulate and characterise paints and coatings as well as home and personal care formulations, all with world-class equipment and expertise. The OTCS maintains strong ties to Omya’s other laboratories in Oftringen (Switzerland) and Cincinnati (USA). Omya is a major global producer of industrial minerals, mainly fillers and pigments derived from calcium carbonate and dolomite, and a worldwide distributor of specialty chemicals. It operates from more than 175 locations across 50 countries and has some 8,000 employees.